Jamb saws, electric or manual will be needed to address cutting door jambs. 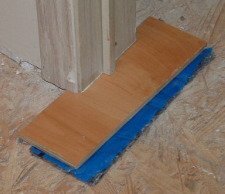 Installing laminate flooring around door jambs can be tricky. 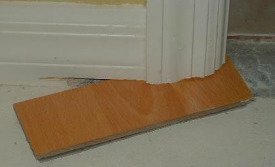 When I undercut door casings, I want the end result to look like the door casings have been installed right on top of the laminate floors. I don't want to see a gap between the laminate and the door casing. 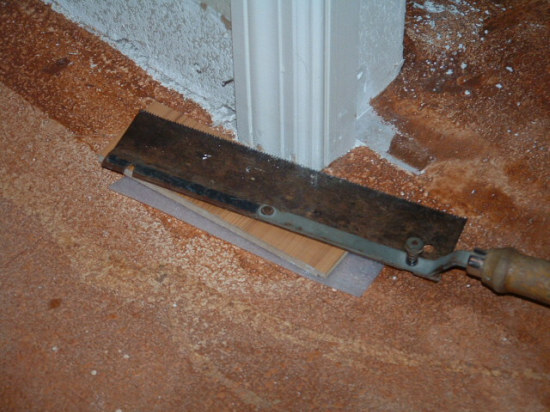 Jamb saws can also be used to undercut other objects as well, such as fireplaces. Undercutting fireplaces requires a different type of blade which is made to fit the saw. The blade is the same type used to cut ceramic tile. It has diamond particles impregnated into it and this is what does the cutting. You may need to undercut both sides of a closet, mainly the type where there are bi-fold doors. The brackets on both sides will have to be removed to do this. In this photo is a hand saw used for cutting door jambs. I got this one at Lowes for about $12.00. The blade is off set so your hand won't scrap against the floor when cutting. The blade also swivels, so you can cut to the right or left. It works pretty good. The only drawback is it can be tough getting in tight spots with a hand saw. They also make a version of this saw that is electric made by Bosch. What I generally use is my electric jamb saw, as in the photo to the left. 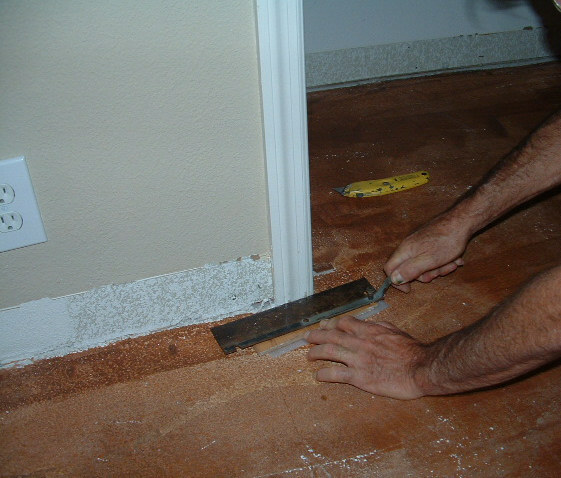 Chances are if you are installing your own laminate floors you don't have an electric saw laying around in your garage. They can be a little pricey, this one cost almost 300.00. If you have a lot of door jambs to cut you may be able to rent one at a tool rental shop. I have seen less expensive jamb saws at Home Depot. The name brand is Roberts. The main objective when cutting door jambs is to cut it at the exact height and to have room under the door jamb for expansion. The first thing I do is to cut a small piece of the laminate, the width of the board by about 3 inches. I also cut the same size piece of underlayment as shown in this photo. I use this as a guide for determining the exact height to where I will cut the door jamb. In the photo above I'm using it to set the height of my electric saw. 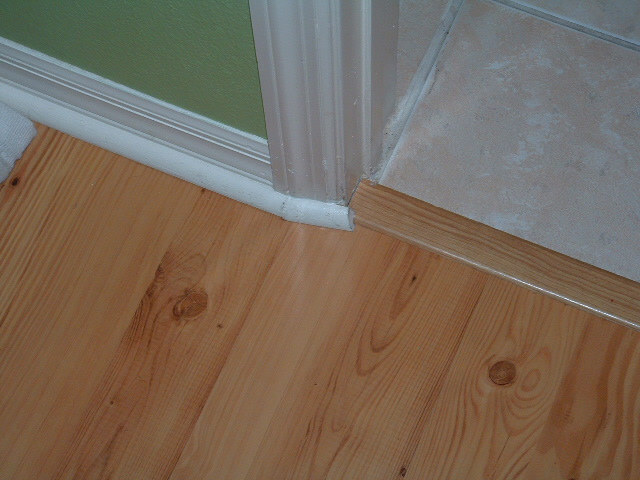 Before cutting the door jambs, make sure the floor surrounding the jamb is smooth. When using the small piece of laminate as a guide you want it to sit flat on the floor to get a nice level cut. What I like to do is to make my first cut where it is least visible ( like inside a closet) to make sure the cut is exactly the right height. There may be times when you don't have this option, you can use the sample piece of laminate with the underlayment and draw a line with a sharp pencil as a guide. When you know your cutting at the right height then continue to cut the more visible jambs. 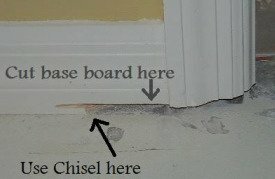 If you are leaving the base board on the wall and installing quarter round to cover the expansion gap, as you cut the door jamb you will have to cut into the base board about two inches or so. This is to allow expansion for the laminate. After you make that cut use a chisel or screw driver to cut that part of the base board out. As shown in photo at left. Lay the small piece of laminate with the pad under it up against the door jamb, lay the saw flat on the laminate using it as a guide. Hold the laminate steady as you cut. Starting on one side or the other is easier then starting in the middle. There is usually some sheet rock behind the base board that I chisel out also. This is necessary for the expansion under the door casings. It also makes it easier when installing the laminate. Here in this photo above, is the end result after cutting the door jamb and base board. 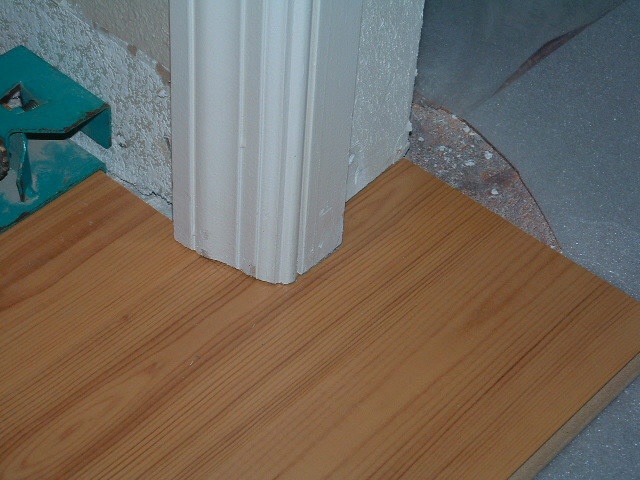 This allows the laminate to slide under the door jamb and the base board. If you don't have an electric jamb saw, it can be difficult to cut inside corners such as when two door jambs form a corner. I have seen a lot of cases where two doorways are connected in a hallway. I have to use my bigger jamb saw (6 inch blade) to be able to reach to the inside of this corner. Even the smaller electric saws won't reach all the way. Another issue I run across sometimes can be dangerous. What can happen is when I cut a jamb, the heat generated by the saw blade causes the door jamb to smolder. After cutting the jamb I can see smoke coming out from it. What I do to stop it is to get some toilet paper or paper towels and soak time with water. Next I force them under the cut door jamb so everything under there is soaked. I use a screw driver to get all of this wet tissue out and then look real close for any signs of smoke. This happens mainly when cutting old growth wood in older homes, or when cutting door jambs made from pressed together paper, mainly in mobile homes. I observed this on a job I was doing. Its an example of someone trying to compensate for not undercutting the door jamb. I think it was a do it yourself job. After you get all the door jambs cut you can move on to the next stage.